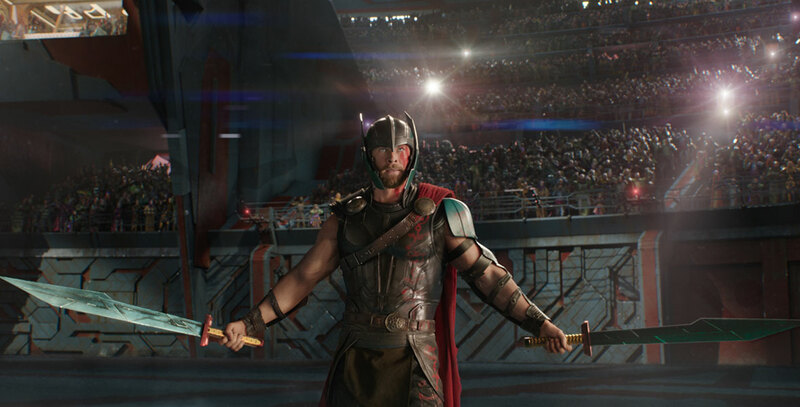 Thor: Ragnarok (film) Thor’s world is about to explode. His devious brother, Loki, has taken over Asgard, the powerful Hela has emerged to steal the throne for herself, and Thor is imprisoned on the planet Sakaar on the other side of the universe. To escape captivity and save his homeworld from Ragnarok, the imminent destruction of Asgardian civilization, by the ruthless Hela, Thor must first win a deadly alien contest by defeating his former ally and fellow Avenger—The Incredible Hulk. Released November 3, 2017, after an October 25 release in Belgium and France. Also in IMAX and 3D. Directed by Taika Waititi. Stars Chris Hemsworth (Thor), Idris Elba (Heimdall), Cate Blanchett (Hela), Tom Hiddleston (Loki), Benedict Cumberbatch (Dr. Stephen Strange), Tessa Thompson (Valkyrie), Anthony Hopkins (Odin), Mark Ruffalo (Bruce Banner/Hulk). Filmed in wide-screen format. From Marvel Studios. 130 min.